Sorry, this is a picture of a picture. But I made this for a friend of mine as part of her Christmas goodies and she requested the recipe 🙂 So this if for you Monica! 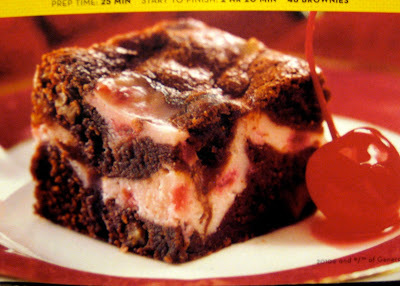 Also before you begin, just adding 1 tablespoon of the juice doesn’t give the cream cheese a whole lot of cherry flavor. If I’m gonna have cherry filling, I want it to taste like cherries. So I actually added 3 to 4 tablespoons of cherry juice and the filling still came out firm after cooking. So my suggestion is add and taste as you go, if you like it at 2 tablespoons then use that. But I suggest 3 tablespoons at least. Heat oven to 350 degrees F. Grease bottom and sides of 13×9-inch pan with shortening or cooking spray. In medium bowl, beat all filling ingredients with spoon until smooth; set aside. In 2-quart saucepan, melt chocolate and butter over low heat, stirring frequently, until smooth; remove from heat. Cool 5 minutes. In large bowl, beat chocolate mixture, 2 cups sugar, the vanilla and 4 eggs with electric mixer on medium speed 1 minute, scraping bowl occasionally. Beat in flour and salt on low speed 30 seconds, scraping bowl occasionally. Beat on medium speed 1 minute. Stir in nuts. Spread 1/2 of batter (about 2 1/2 cups) in pan. Spread filling over batter. Carefully spread remaining batter over filling. Gently swirl through batters with knife for marbled design. Bake 45 to 50 minutes of until toothpick inserted in center comes out clean. Cool completely, about 1 hour. Cut into 8 rows by 6 rows. Store covered in refrigerator. « Best Chocolate Chip Cookies Ever!! » Getting started! !